(Katushka) [Luker et al., 2015; Shcherbo et al., 2009; Gurskaya et al., 2011]. 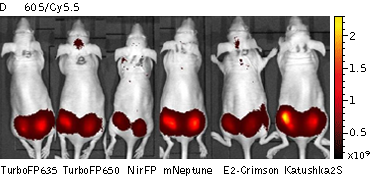 together with iRFP720 [Luker et al., 2015] for dual color whole body imaging. Katushka2S normalized excitation (thin line) and emission (thick line) spectra. 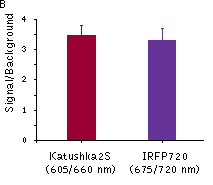 Katushka2S can be recognized using Anti-tRFP antibody (Cat.# AB233-AB234) available from Evrogen. using Texas Red filter sets or similar. 12 hrs after transfection. 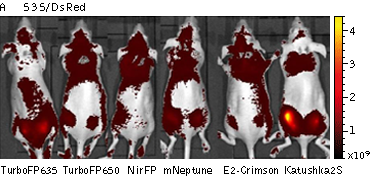 No cytotoxic effects or visible protein aggregation are observed. at various excitation and emission channels. 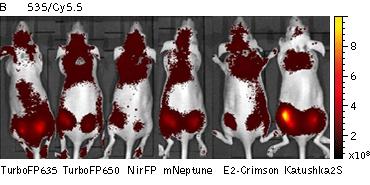 Whole-mouse imaging with IVIS Lumina II system (PerkinElmer). (µW/cm2). 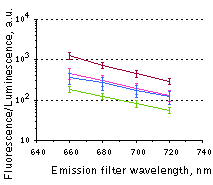 Note that scale bar differ for images with different excitation and emission filters. filter combination. 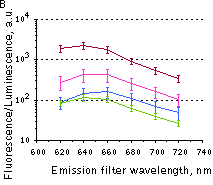 Pseudocolor scale bar: radiant efficiency (photons/s/cm2/sr)/(µW/cm2). mCardinal (blue) and mNeptune2.5 (green). 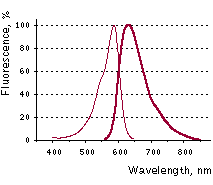 Fluorescence signals acquired with IVIS Spectrum system (PerkinElmer). 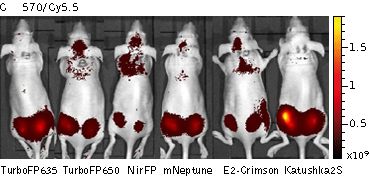 with HEK293FT cells transiently expressing Katushka2S or iRFP70. (B) Signal-to-noise ratios at optimal excitation and emission wavelengths for each protein. pKatushka2S-C is a mammalian expression vector encoding far-red fluorescent protein Katushka2S. or Katushka2S alone in eukaryotic (mammalian) cells. 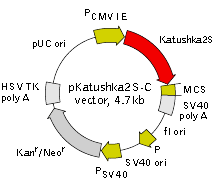 Katushka2S coding sequence and SV40 polyadenylation signal (SV40 polyA). 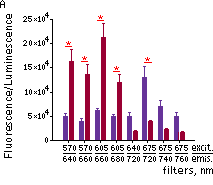 signals (SV40 poly A) direct proper processing of the 3'-end of the reporter mRNA. 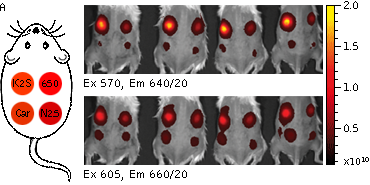 pKatushka2S-N is a mammalian expression vector encoding far-red fluorescent protein Katushka2S. (30 μg/ml) to E. coli hosts. Copy number in E. coli is about 500. (humanized) [Haas et al., 1996]. choice. 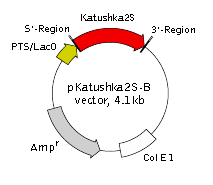 Alternatively, Katushka2S coding sequence can be amplified by PCR. propagation and selection in E. coli. TagBFP, TagRFP, FusionRed, TagFP635, mKate2 and PA-TagRFP.